"Angela Merkel stole our holiday", Rosie - Maria do Rosario – declared. Ooops really! Making Mrs Merkel the grinch who stole Corpus Christi is a bit strong you might think. Just remember, though, that until recently the Feast of Corpus Christi had been a much loved holiday in Portugal. Now it's just another working day. Worse still, the Vaca das Cordas, Ponte de Lima's oldest festival, dating back, so I'm told, to 1646 was always on the eve of the holiday. Now it has had to be moved. Take a look at this tribute, which you will find on the main avenue. You don't forge a statue like that and give it a prominent position by the parish church unless you care a great deal for the festival, do you? Of course it stands to reason that someone must be to blame for all this messing about with much loved customs! Who better as a scapegoat than the leader of a rich country that hasn't had to endure austerity while you have been having a pretty tough time? Sorry Mrs Merkel! Here are just a few of the people waiting for the action. To me, the odd thing about this festival is its name, the Vaca das Cordas'. 'Vaca' means cow and yet the animal involved is a 'touro' or bull. Rosie, who has an interest in, and knowledge of, this festival because it all starts from her manor house, has an explanation but we'll come to that in due course. First, though, I have a caveat. 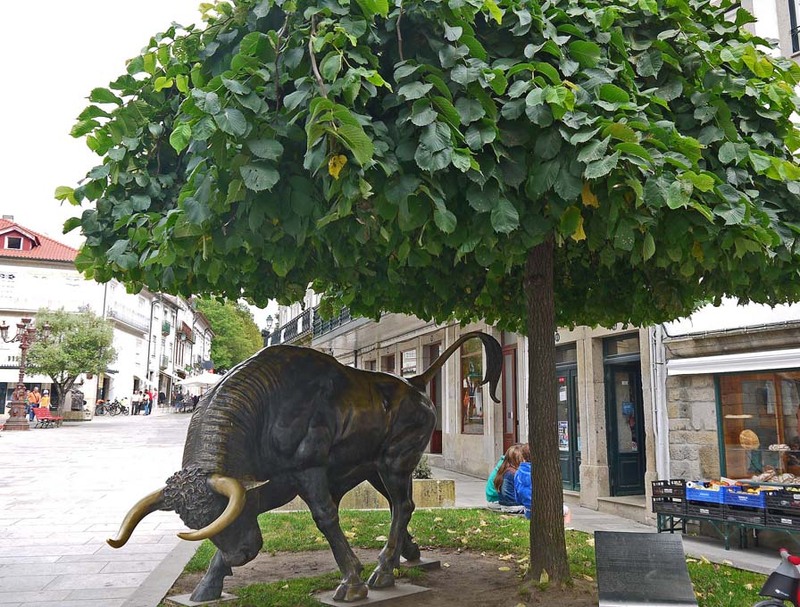 The bull is not harmed in Portugal: there are no darts implanted in its shoulders to weaken it as in Spanish bull fights, nor is it killed at the end of the event. All the same, if you subscribe to the belief that all animals should be accorded dignity at all times and cannot bear it if this is not the case then, as they say on TV when the football results are broadcast before the fans have had time to watch the recorded game, "Look away now!" Personally I am ambivalent about such activities. 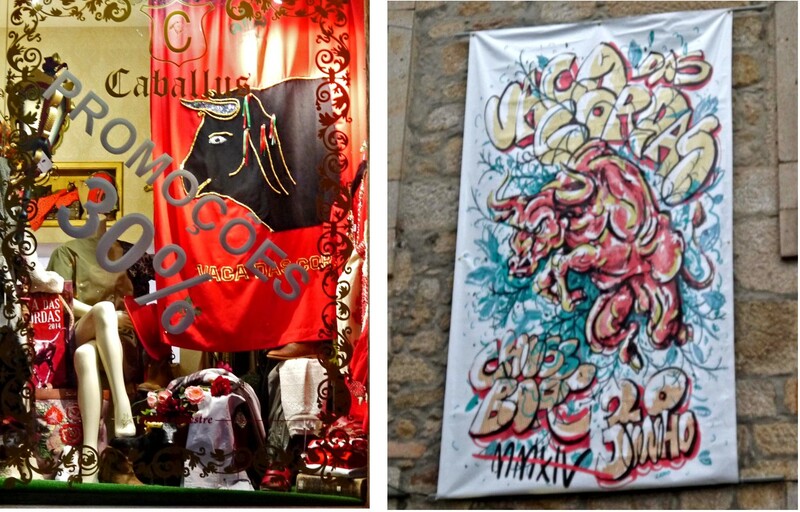 The Vaca das Cordas is a tradition of much antiquity and, though the bull may get frightened or angry on one day in the year, it also sometimes has the chance to get its own back. Let's meet this this year's star of the show. Here he is in his cowshed beneath the manor house on the eve of the festival. His horns have been trimmed and bound in soft cloth and ropes, the 'cordas' of the title, attached to them in readiness for the customary parade through the streets on the morrow. For the time being he is just the object of curiosity for people, like us, who want to see him close to but from a place of safety. Ponte de Lima meanwhile was gearing up for fun. Everywhere we went there were sound systems blaring pop music and stalls being set up to serve beer – Super Bock seemed to be the most popular, though I thought it should be the more patriotic sounding choice, Sagres – vinho verde, sangria, bar-b-que meat, burgers and 'farturas', those delicious-weight-gain-and-heart–attack-provoking batter fingers better known to some in the Spanish form 'churros'. There were celebratory banners adorning the streets too. Here are a few of them. Now I am nothing if not a coward. I really wanted to see the spectacle but I had no desire to get anywhere near the flailing hooves or tossing horns of an irritated bull. How terrifically lucky it was then that we had chosen to stay in the Mercearia da Vila, a delightful guest house in the centre of town just next to the parish church. 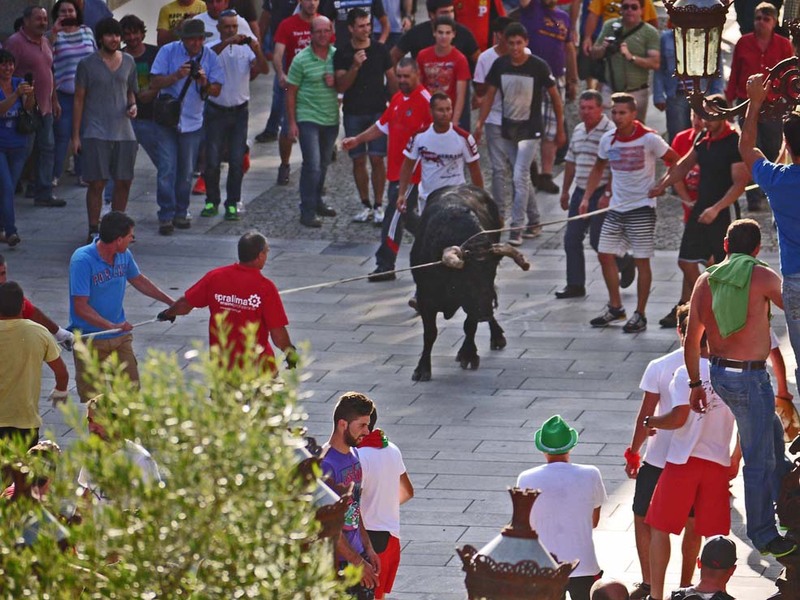 By tradition the bull is taken three times round the church, controlled by young men with more bravado than sense, who hold tightly on to the two ropes attached to its horns to prevent it from running wild. This was the view from my bedroom window. 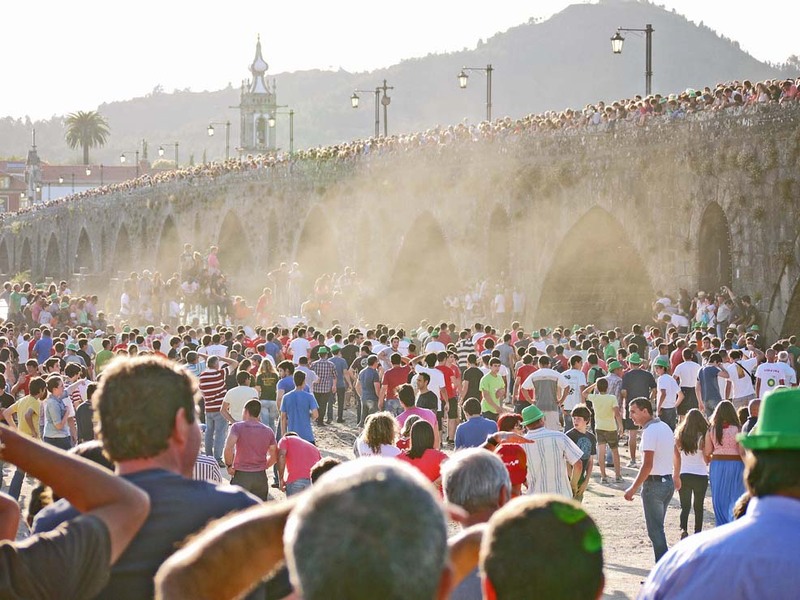 After circling the church, the bull is taken down on to the wide river beach next to the bridge, which serves as a gallery, providing the crowds with a superb view of the proceedings from a safe place. 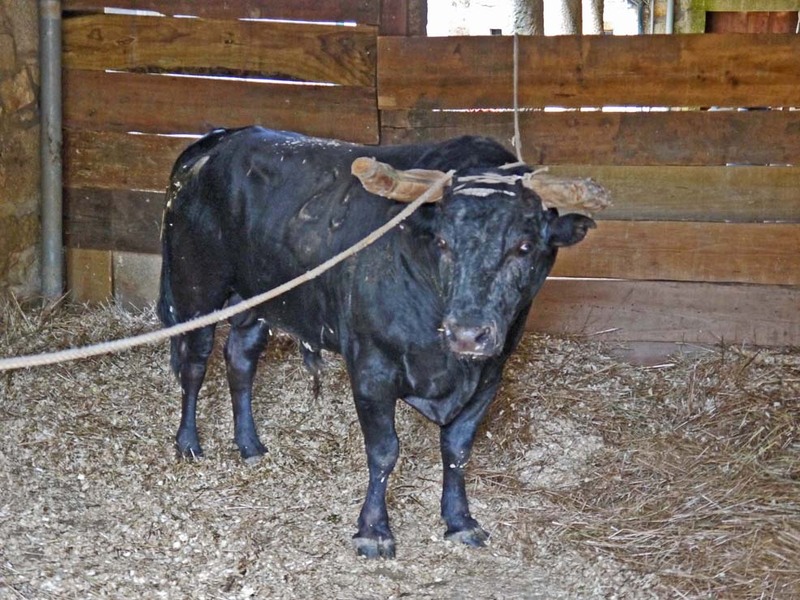 Once away from the streets, the ropes are relaxed and the bull is given much more freedom. We followed the crowds down to the riverside walk to see what happened next. Sadly I am hopelessly short for witnessing proceedings from the heart of a crowd. Photography was even more difficult as people and dust swirled around me. I was told, though, that many young men approached the bull, daring it to charge, which it sometimes did. Apparently a number of youths failed to get out of the way quickly enough. "It harvested six or so I'm told," said Rosie. Harvested? The word her informant had chosen was one used for the grape harvest. It seems the bull had picked up the young men and flung them skywards as though they were of no more weight or importance than a bunch of grapes. The flying dust from the bull's charges was all I could see, though. Have you noticed all the folk on the bridge? Friends told me they had tried to cross it earlier in the day but the crowds were so huge that the path was blocked. Eventually the bull was taken back to its stall to be fed and watered and to get over the excitement of the day. The people, however, were not ready for bed. 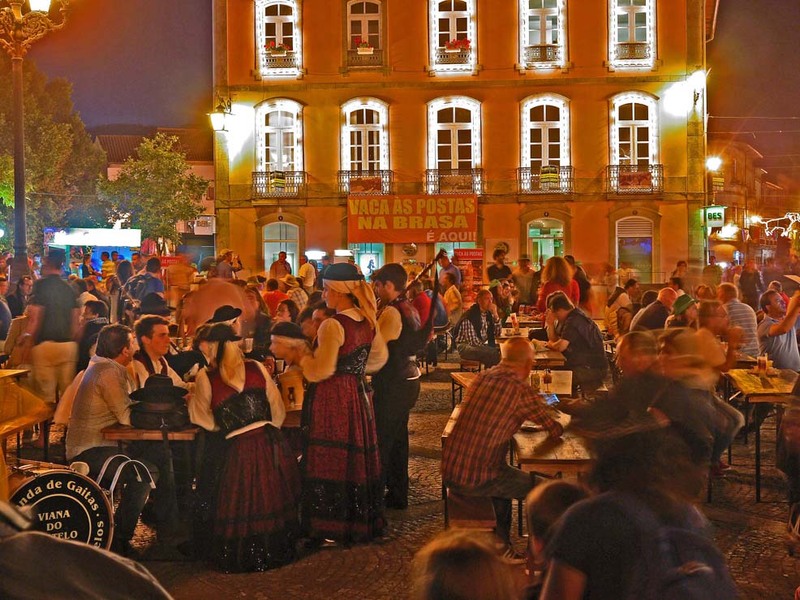 For them there was food, drink and socialising at trestle tables put up in Camões Square or in the bars, taverns, restaurants, cafes and pop-up street parties. There was entertainment too in the guise of a folklore group from Viana do Castelo - you can see them with the rest of us in the picture below, but more of them another time. We met up with friends and talked over what we had seen. "People are saying the bull was no good because nobody ended up in hospital. We judge how successful the festival is by the numbers on the wards," said Rosie. Well, that's one way of looking at it I suppose. In my book it's a success if no one is hurt but it seems mine is a minority view in Ponte de Lima. Rosie went on to explain why the festival is called the Vaca das Cordas when the animal is manifestly a bull not a cow. She said that the cow had been sacred to the goddess Io in Roman times and that there had once been a temple to Io with a statue of a cow on the site of the present parish church. When the area was Christianised, so the story goes, the image of the cow was removed from its niche, attached to ropes and dragged round the new church, just as the bull is taken around to today. Why the seventeenth century Limianos decided to create a festival with a bull seems to be unknown though the cult of bulls has always been important all across the Mediterranean. We only need to think of bull fighting in Spain, bull leaping amongst the Minoans as depicted on their frescos and the legend of the Minotaur. And so in the wee small hours of Saturday we eventually went to bed, ears ringing and eyes weary but with a new understanding of the traditions of the Minho. Hi Margaret, You really did strike gold with that hotel room! I'm not sure how I feel about Vaca das Cordas but I'm not keen on terrorising animals for entertainment even if they aren't maimed in the process. It was fascinating to read your account of it, especially with the background, although I don't think I could cope with the crowds so I'm unlikely to ever witness it. Hi Julie, I think British people do find animal spectacles hard to deal with and I sympathise with your comment. I like to try and keep an open mind, though, and as bull festivals go, this is one of the least bloodthirsty. 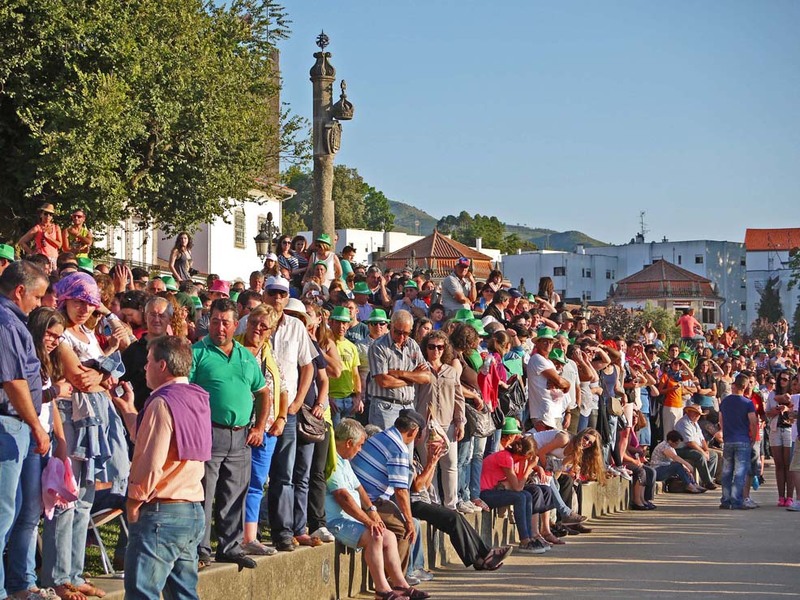 Whether the fact that a tradition is old has any bearing on the argument is a moot point but this is, I understand, Ponte de Lima's oldest licensed festival. What I am pretty sure of is that it is not for me, an interloper, to interfere unless my opinion is actively sought. So yes, like you, I'm not sure how I feel about the Vaca das Cordas. The crowds, by the way, were jolly and well behaved. There wasn't a policeman in sight. None was needed. The Portuguese en masse behave themselves pretty well, don't you think? Really! Well that is both news and a disappointment. It certainly alters my feelings about such a festival. I didn't know.